Scientists say on way to solving anti-matter mystery, European scientists reported about the creation and capture of anti-hydrogen atoms in a novel magnetic trap and said it put them on track to solving one of the great cosmic mysteries – the make-up of anti-matter. Anti-matter is of intense interest outside the global scientific community because it has often been cited as a potential source of boundless and almost cost-free energy. The announcement from CERN, the European Organization for Nuclear Research, came just three weeks after another of the three teams working separately on the problem at the particle research centre near Geneva said they had briefly made and caught the elusive atoms for the first time. 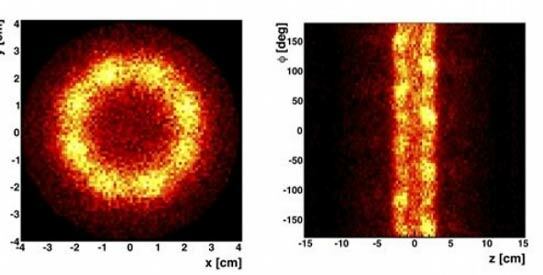 “With these alternative methods of producing and eventually studying anti-hydrogen, anti-matter will not be able to hide its properties from us for much longer,” said Yasunori Yamazaki of the team that scored the latest breakthrough. Anti, or neutral, matter is believed to have been created in the same quantities as conventional matter – the substance of everything visible in the universe including life on earth – at the moment of the Big Bang 13.7 billion years ago. A theme of much science fiction, it was only discovered by US physicist David Anderson in 1932. As the latest breakthrough was reported, CERN engineers were closing down the centre’s showpiece Large Hadron Collider or LHC for a two-month break after eight months of scientific success in research into how the universe began. CERN’s Director-General Rolf Heuer told Reuters that new discoveries were rolling in so fast that it was likely the initial phase of LHC operations would be stretched to the end of 2012, a year longer than planned. His deputy Sergio Bertolucci said the LHC was moving rapidly into totally new territories of scientific knowledge and the coming months could bring real insight into the “dark matter” that makes up 25 percent of the universe. Physicists and cosmologists speculate that “dark matter” – so called because it reflects no light and cannot be seen – could account for at least some of the missing anti-matter, particles which were first spotted at CERN in 2002. Some suggest it may have also some relation to the “dark energy” that constitutes about 70 percent of the universe leaving only 5 percent for the visible parts – galaxies, stars and planets – that can be observed from earth or nearby. Monday’s announcement said the “ASACUSA” experiment, in a CERN storage ring known as the Antiproton Decelerator or AD, captured “significant numbers” of anti-hydrogen atoms in flight in a particle trap called CUSP. Last month the parallel, and complementary, ALPHA experiment at the AD captured 38 anti-hydrogen atoms in flight and held them fleetingly, making possible initial observations of their properties and behaviour.